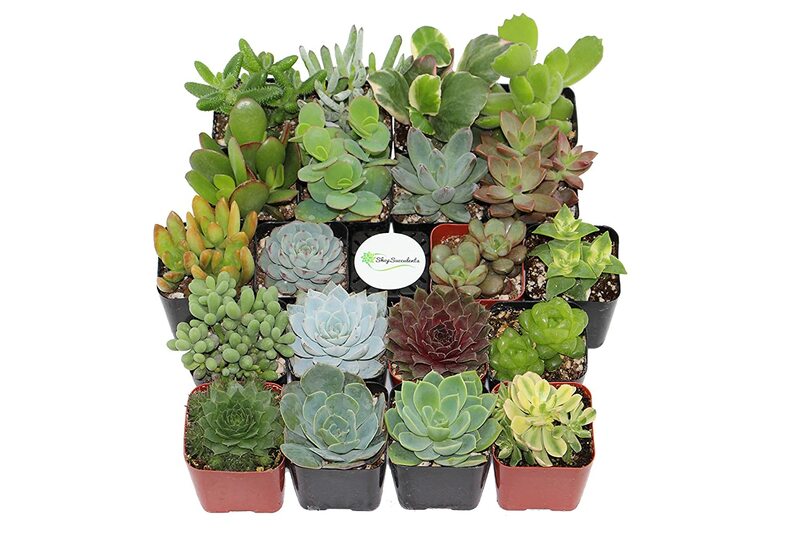 These beautiful succulent assortments come in a variety of quantities and are a perfect addition to any garden! These 2 inch succulents are popularly used as favors for weddings and party events. These packs include a beautiful array of colors and textures that are intended to amaze. Succulents come in 2 inch square pots fully rooted in soil. Plant measurement will vary as different species grow in different ways: for example, some grow wider, shorter, taller, trailing etc. Each plant in these assortments will be a different species! Each order is meticulously packaged in Shop Succulents retail packaging which makes these packs a perfect gift! Succulents come rooted in soil, in their 2 inch square pots and no two succulents are alike. All orders are packed in Shop Succulents retail packaging and come with helpful care instructions. Perfect favors for weddings, baby showers and events. Beautiful color schemes that will light up a room. Please be sure to promptly remove the plants completely from their boxes upon arrival. Often times the plants will need a little water, sun, and some loose soil gently brushed from leaves after transit. This wonderful collection of thriving baby succulents are easy to grow and maintain.